Last week, I had to pinch myself a LOT. 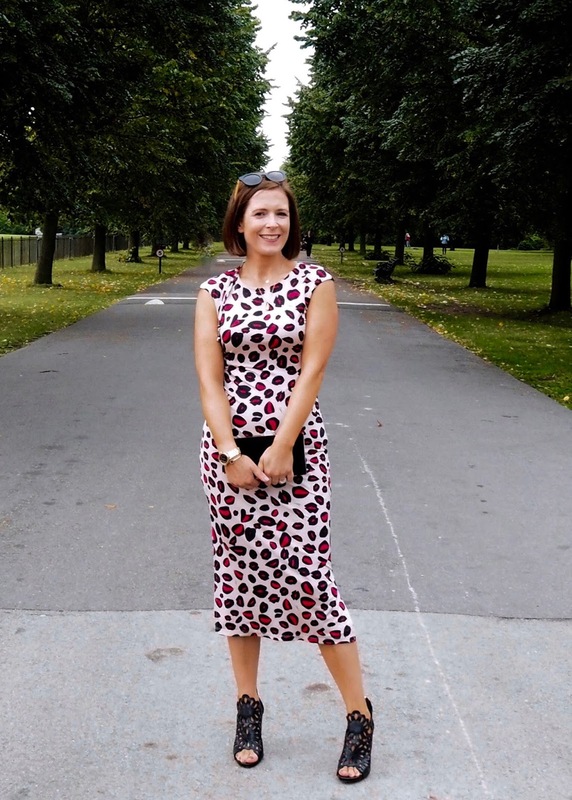 I was invited along to the re-launch of one of Kate Middleton's favourite brands, Issa London, literally in Kate's back garden at the Orangery in Kensington Palace! There's thankfully only one 'official' photo of me...deep in conversation with Lucy from House of Fraser who designed the whole range. You can also see Nikki from Midlife Chic in green - my date for the night. More on that again! 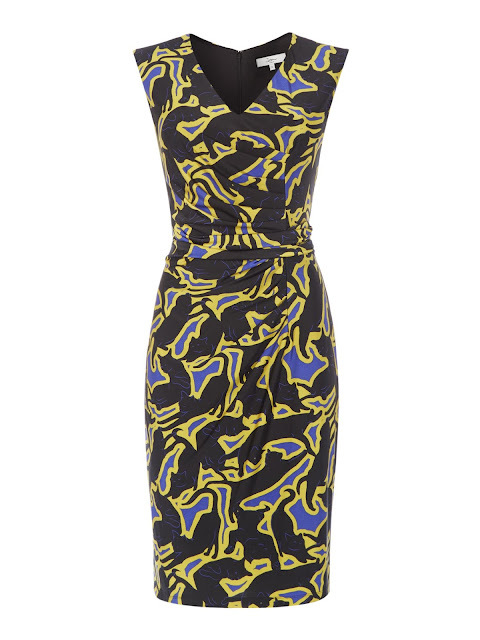 It's a jersey midi dress in one of the iconic Issa London prints - it's meant to be lips but I think it's got more than a bit of animal print going on. For me, it was not just the print and fit but the fact that this dress has the potential to work in so many situations. 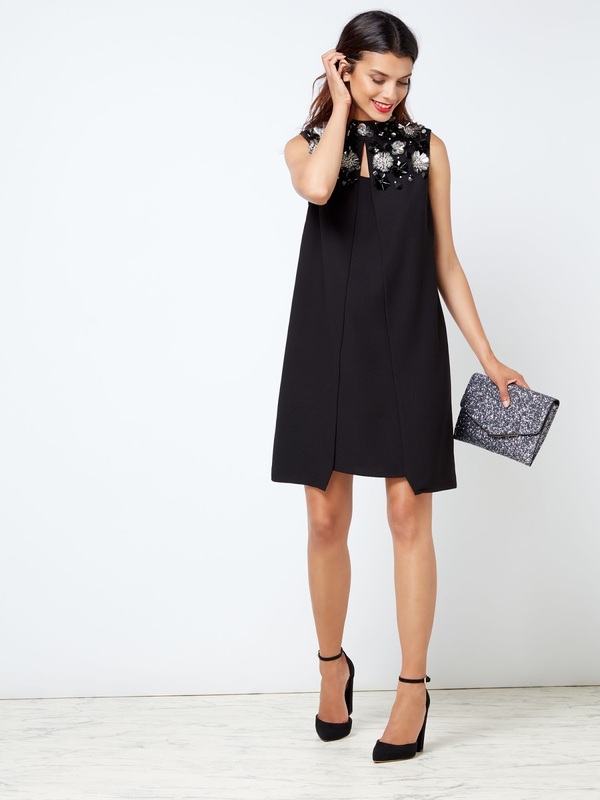 Add some ankle boots or trainers and it's casual, mid heels and a blazer, and it's work appropriate, a fur shrug and sky high barely there sandals, and it's ready to go 'out-out'. Size-wise, I'm wearing the 10 which is spot on. It's clingy because of the style of the dress and the material - a kind of sheeny jersey (not the official term!) but that didn't worry me because it's fully lined and anyway, this dress needs curves to work. So I stuck on my spanx pants and added a two sizes bigger bra and bob's your uncle! But can we take a moment to appreciate these shoes? They are my 'better back' gift to myself simply because they're probably the worst thing to wear with a dodgy back. Actually, the shape of them and the fact that they're so exquisitely made, means that they're as kind to the back as a stiletto high heel can be. I wore them all evening and didn't have a rub or blister, nor was my back sore the next day. I bought them in Honey Essential Boutique on the Lisburn Road in Belfast and they were in the sale. If you're local, it's worth popping in fast because there are some amazing reductions at the moment...but only for a short time. If you're not near Belfast, check out their Instagram as they share lots their stock on here and can do postal sales over the phone. Back to the dress and I wanted to tell you that it didn't crease one bit despite being rolled in a ball in a suitcase on my travels. The day I got home from London, I threw it in the washing machine and it dried on a hanger overnight, ready for its next outing! That's my kind of dress. The brand subsequently dressed Kate on a number of occasions but being a small company, they struggled to keep up with the demand for their clothing because of Kate. There followed a couple of changes in ownership and the brand even went out of business briefly. Last year, Issa London was acquired by House of Fraser, who have relaunched it at a more affordable price point, while still retaining lots of elements of what made the brand so successful in its early days, like the flattering cut of their jersey dresses and the stunning prints. So what else does the collection have to offer? The whole range is on this link but having seen a few real people wearing the dresses, I thought I'd give you my three favourites that are currently in stock. Lots of the range has sold out or is getting close to selling out - though further drops of new styles are scheduled to arrive in coming weeks. Issa also launched a range of occasion bags that are incredibly well priced. I love this one in the iconic Issa print. Limited stock at the moment. It comes in 3 colour ways. Finishing with my claim to fame - though I wasn't fully aware of it. I had no idea who this girl was when she arrived (though I was given the low down when I asked!). No, of more interest to me is what Millie Mackintosh was wearing on the night, another STUNNING Issa dress that's yet to drop. I'll let you know when it does. It will retail at £99. Love how she's accessorised it with a gold belt. You can see the whole Issa London collection on this link and in store at House of Fraser. Thank you to the HOF team for the invite to this event. I wasn't paid to be there and I'm not being paid to write this blog post. I was gifted the dress and clutch I wore on the night. Back to porridge this week again but my back is improving and that is giving me lots to be happy about. I even managed not to throw my laptop at the wall when this blog post crashed the first time I wrote it (entirely) and I had to rewrite from scratch! Looks wonderful, I love your dress! What an experience Avril, you look gorgeous as do the other bloggers too. Do ISSA do tops as well or is it mainly dresses they specialise in? Cant see any tops on the web site.